Microgaming take online sloty to another level yet again with this adventurous 5 reel. Microgaming were there at the very beginning creating the world's first online casino in 1994. Online gaming has radically changed since then, as have their ever expanding catalogue of games, accomplishments and awards. Having created more than 850 unique casino games, they keep their portfolio fresh releasing new games every month. If you like Microgaming and want to discover more then please click here. Adventure Palace is exactly as it says on the box, a great adventure. The soothing sounds of the jungle compliment this colourful jungle themed offering from Microgaming. Packed with features and great game play, it is easily one of their best. Set against a jungle expanse, there are five reels and seven bet lines to play. The reels are decorated with theme inspired symbols. Firstly the line payers are playing card values Nine to an Ace. The high payer is the Ace, line up four and you will win 50.00, five aces will award you 62.50. Next we have the medium symbols, a cobra, a tiger, two exotic birds, a peacock and a monkey. Big payer here is the tiger. Line up four tigers and you’ll scoop 75.00, line up five and you’ll net a whopping 562.50! Definitely worth a trek through the swamp. The landscape image is the scatter and an elephant is the wild. Set your bets, from 0.09 to 45.00 - bare in mind to reap the potential 150,000 and bigger jackpots, you need to be playing at max level. That said, you can still score some good prizes even at lower stakes. Just on a 5.40 stake I set auto spins off for 50 spins. 24 spins in, I triggered the free spins bonus during which I lined up 4 peacocks and with the treble feature I won fantastic 1,517.40! Watching your total climb on screen atop a fountain of twirling coins is awesome! Free Spins, two words I always like to see and this slot has a tidy fifteen on offer if you land three or more scatters across the reels. Furthermore, this feature can be re-triggered during Free Spins play adding more free spins to your total. The elephant wild doubles for all symbols, except the scatter and any winning combo it is a part of will see your winnings doubled! A musical burst alerts you any events or wins and you can watch your total ring up in the win box. Playing at the maximum level can really earn you some sizeable returns. Land three elephants and you will win 1,000, four will see you win 10,000 and five yields the jackpot and that will do nicely, 50,000! Further thrills await with a gamble feature. Any win can be gambled on if you choose. It’s a game of chance and you could double or even quadruple your winnings. The green colour scheme is nice on the eyes and the panel is very neat and easy to understand. The boxes beneath the reels show your credit, your bet stake and your wins. It even keeps a record of your wins in a handy pop up panel. Then you have the auto spin button and the start button. I enjoyed playing Adventure Palace a lot. The graphic aren’t outstanding or the best I’ve seen and it has little in the way of animation and the like, but what it lacks in this area in makes up for in the main area and that’s game play. I found the winnings to be quite ample and I would definitely add this to the favourite list. Read more about casino by mobile and claim your free spins today! 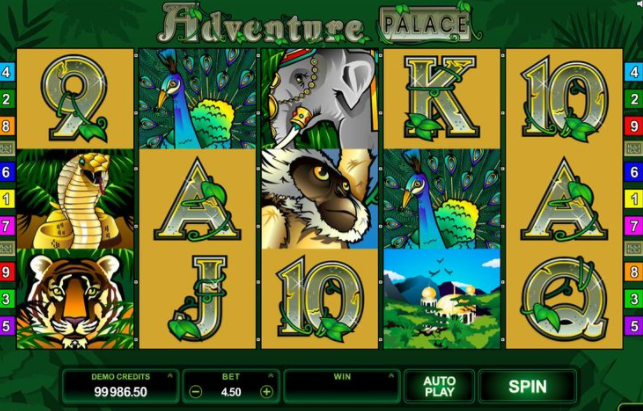 Adventure Palace is a great slot experience and the huge jackpot should prove very attractive, especially to high rollers. Low rollers and newbies should be drawn to its attractive stake range and ease of play. Quick to pick up and smooth game play, it’s already a hit with players familiar with high grade offerings from Microgaming and it’s likely to find a bigger audience and enjoy a lot of return play.